A federal judge today issued a preliminary injunction stopping the U.S. Navy from deployment of a new high intensity sonar system that could hurt or kill whales, dolphins, seals and sea turtles with its loud signals. Granting a request by five environmental groups, U.S. Magistrate Judge Elizabeth LaPorte ruled that the National Marine Fisheries Service issued the Navy a permit that likely violates federal law. On July 15, the Navy received its permit to "harass marine mammals" in the course of operating low frequency sonar used to detect submarines while remaining outside the range of their onboard weapons. The Navy has been approved to deploy two ships that use the new sonar system. liberal standard applicable under these statutes," the judge found. Scheduled for immediate deployment, the sonar system, known as Surveillance Towed Array Sensor System Low Frequency Active sonar (SURTASS LFA), relies on very loud, low frequency sound to detect submarines at great distances. The environmental groups argued that the survival of entire populations of whales and other marine mammals are jeopardized by the deployment of this sonar, which has been measured at 140 decibels 300 miles away from the sound's source. No Navy spokesperson was available for comment on the injunction. But the Navy maintains that SURTASS LFA is an essential component of the U.S. defense arsenal. hearing for their very survival." 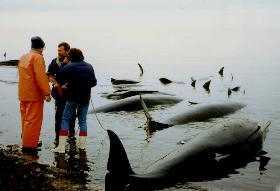 National Marine Fisheries officials respond to a pilot whale stranding. "Deployment of LFA over 75 percent of the world's oceans, more than 14 million square miles in the first year alone, threatens marine life on a staggering and unprecedented geographic scale, not just the 'small number of marine mammals' that the law allows, but countless marine mammals around the world," Reynolds said. There are two types of sonar - passive and active. Passive sonar listens for noises in the water. Active sonar sends out a loud, low-frequency signal and waits for responding signals that bounce off distant objects such as submarines. Scientists claim that, during testing off the California coast, noise from a single LFA system was detected across the breadth of the North Pacific Ocean. Still, in granting the permit, the National Marine Fisheries Service said the sonar will have "no more than a negligible impact on the affected species," and "will not have an unmitigable adverse impact on the availability of these species or stock(s) for subsistence uses." But Naomi Rose, a marine mammal scientist with the Humane Society of the United States, one of the coplaintiffs, says, "From a scientific point of view, there is very little question that, given the right set of circumstances, active sonar can kill marine life." "The frightening thing about LFA is that we're flying blind, because the Navy has never seriously applied the lessons from previous strandings to its LFA system," said Rose. 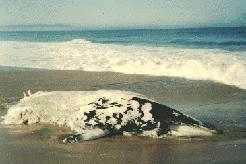 The mass stranding of multiple whale species in the Bahamas in March 2000 and the simultaneous disappearance of the region's entire population of beaked whales has been linked to another type of Navy sonar. A federal investigation identified testing of a U.S. Navy mid-frequency active sonar system as the cause. In late September, new mass strandings occurred in the Canary Islands as a result of NATO military sonar, and in the Gulf of California two whales died as the likely result of an acoustic geophysical survey using loud air guns. "The court properly found that the decision to authorize and deploy the LFA system cannot be justified under federal law," said Andrew Sabey, a partner with the international firm of Morrison & Foerster, which is representing the plaintiffs NRDC, the Humane Society, the League for Coastal Protection, the Cetacean Society International, and the Ocean Futures Society and its president, Jean-Michel Cousteau. "The ocean is a precious resource shared by all the world's peoples," said Cousteau. "The LFA permit is nothing less than a license to kill, and we are enormously grateful to the court for protecting our children's heritage."